It’s that time of year in Quebec that the weather and the roads are unpredictable. You could wake up one morning to ice and snow, another to rain, and yet another to sunshine. Even worse, you could get all of that in one day. 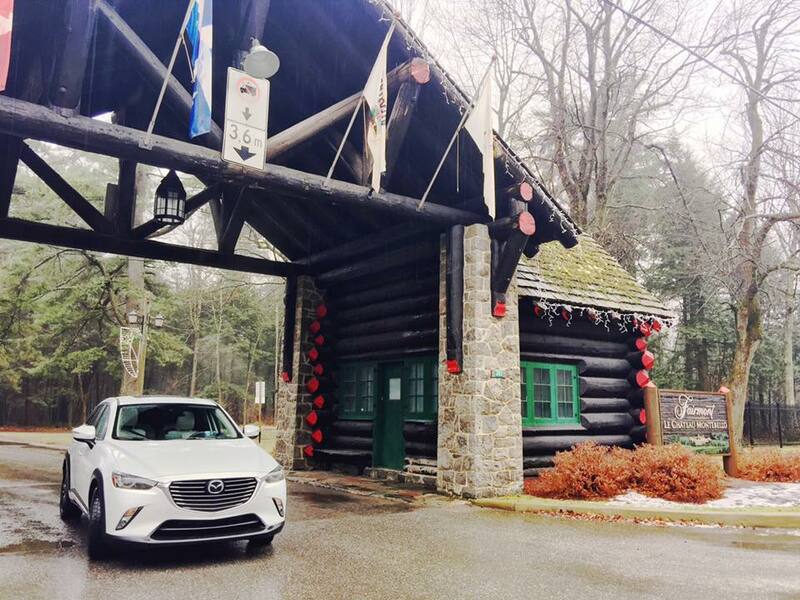 Road trips during this time of year need extra planning, which is why I was grateful for the Mazda CX3 GT during our Montebello road trip. A friend and I decided to take our kids, both girls, to Montebello for a girl’s getaway. 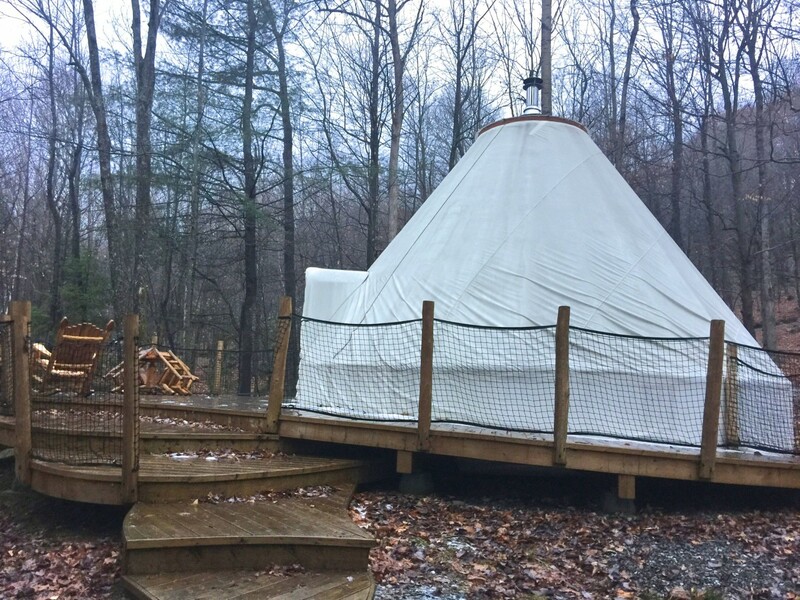 We drove from Montreal to Montebello for an epic adventure filled with giant log cabins, wild animals, slippery roads, and quaint tents. Come along for the ride. The Mazda CX3 is a subcompact-sized crossover designed for urban usage with the occasional weekend getaway thrown in. While in the city, I managed to slid a huge Christmas tree in the back yet I could fit into almost any parking spot. The real test would be the Montebello road trip with two adults, two kids, and plenty of luggage. Add in slippery roads and lots of wildlife and you have a road trip adventure worth noting. 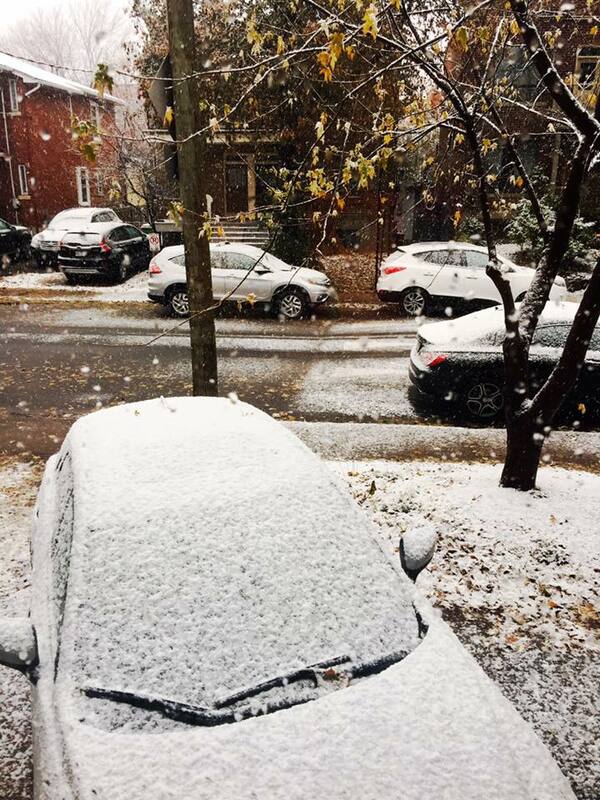 We woke up Friday morning to snow in Montreal. With good handling dynamics and all wheel drive on the Mazda CX3, I wasn’t worried about a little snow. We packed the SUV and began our road trip. The trunk space was limited but we managed to fit two suitcases, a backpack, and a small bag with boots and winter clothes. We were all set. The drive was a little over an hour and a half. Mostly highway driving, it was smooth and easy. I set the self-adjusting cruise control and enjoyed the new roads. It was my first visit to Montebello. 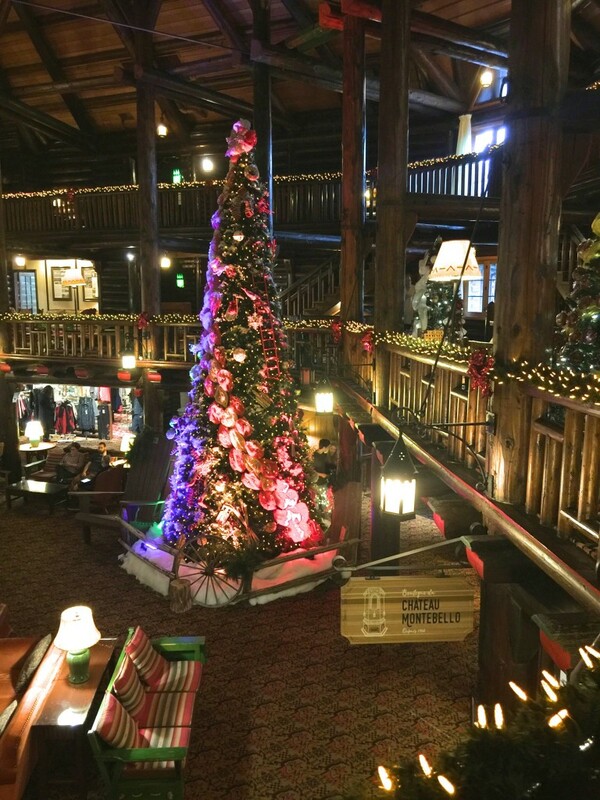 We arrived at Fairmont Montebello, the world’s largest log castle, for the first night of our stay. Traveling with kids, we loved Fairmont Montebello’s indoor, heated, 75-foot swimming pool. With underground connections to the hotel, the indoor pool can be enjoyed year-round without having to set foot outside. We all played games and splashed in the pool until I was too cold to stay in any longer. Rather than asking the kids to get out, the adults went to the hot tub and the kids enjoyed extra time in the pool. Two large hot tubs overlook the pool so I could be warm and cozy and still have Athena in my sights. Fairmont Montebello is a destination in itself and we’d visit again for the pool alone, but our reason for visiting the Montebello region was yet to come. We had Parc Omega in our sights. 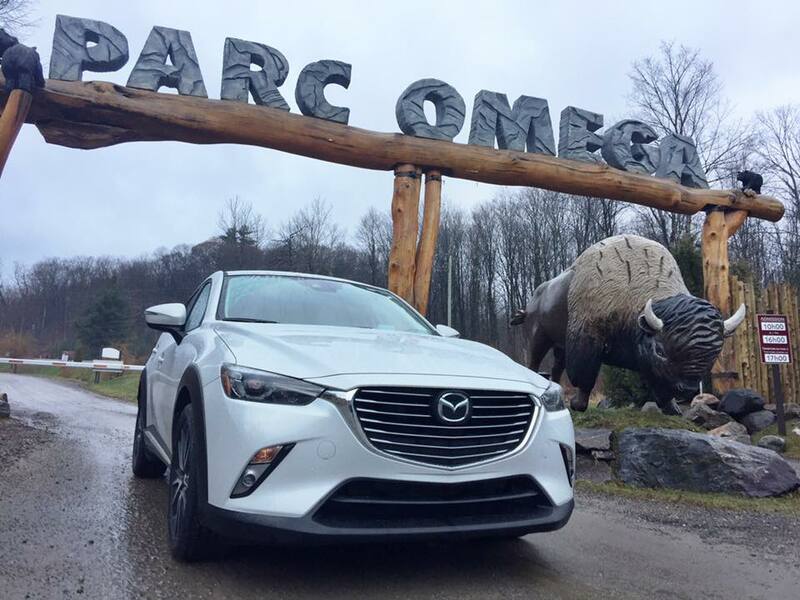 At Parc Omega, you follow a winding 10-km road in a 1,500-acre park and discover animals all within their natural environment. You can observe bison, elk, bears, deer, moose, goats, and wolves, step out of your car and walk along trails, a lake, and among white-tailed deer, and participate in several activities that take place throughout the park all year. As we drove into the park, we were greeted by elk and deer. They weren’t shy to stick their entire head into the vehicle for a carrot so we got some animal lovin’ from the moment we drove in the entrance. 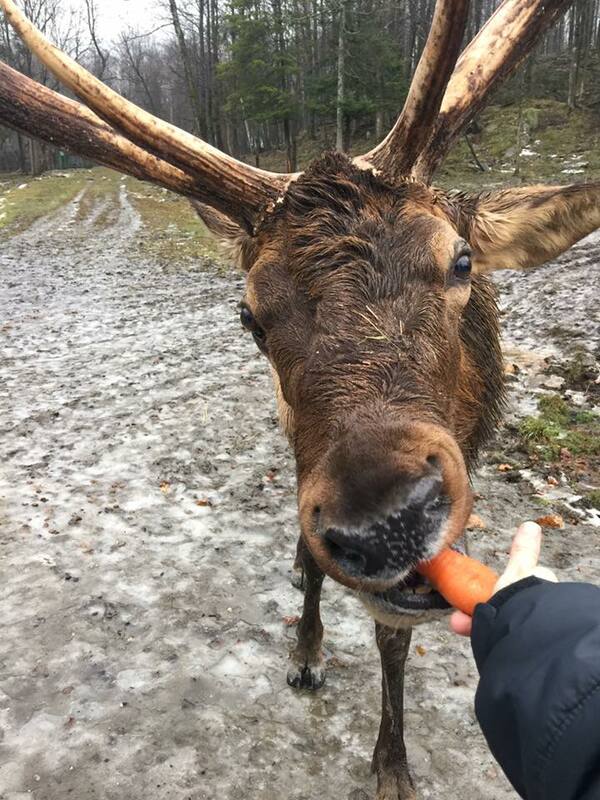 The more elk we fed, the more comfortable we felt. They weren’t aggressive or forceful. They were gentle and calm. It was the closest I’d ever been to such a beautiful wild creature. Up next, we stopped at a deer-feeding area along a beautiful lake. 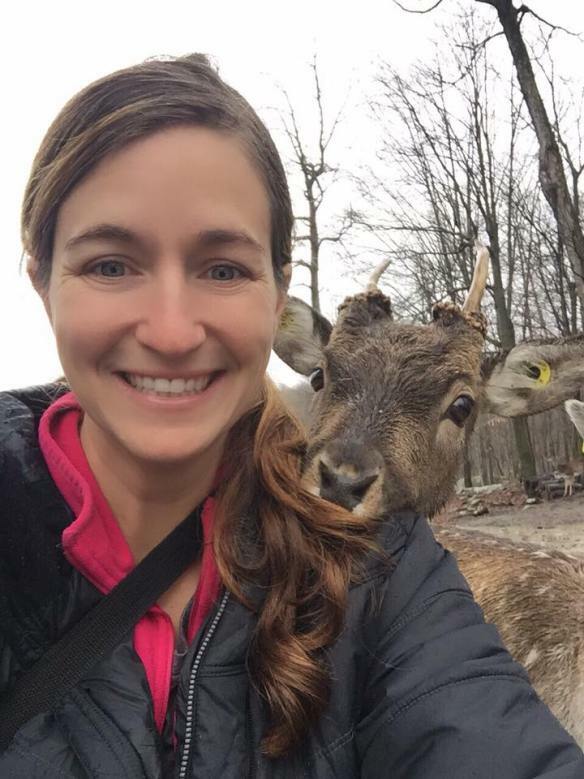 I crouched down to take a photo and a small deer rested his head on my shoulder like he was posing for a selfie. I wanted to pause that moment and live in it for at least a few more minutes. It was like I was a princess in a Disney movie and all the wild creatures were my friends. 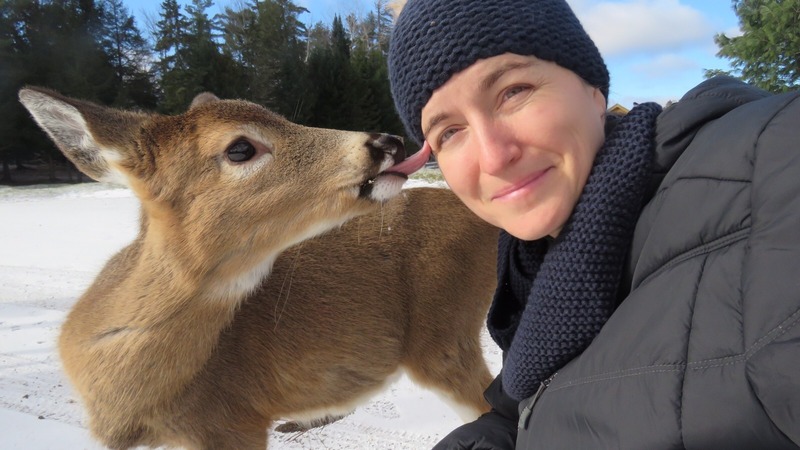 I was certain the deer selfie was going to be the greatest experience of our visit until a deer licked my face at the next stop. While we were walking around one of the picnic areas, I crouched down again to get a photo with the many deer that were near by. This little cutie walked up to me and licked my face just as I was taking the photo. I didn’t pull a still from a video; this was the actual timing of the shot. It was magical. 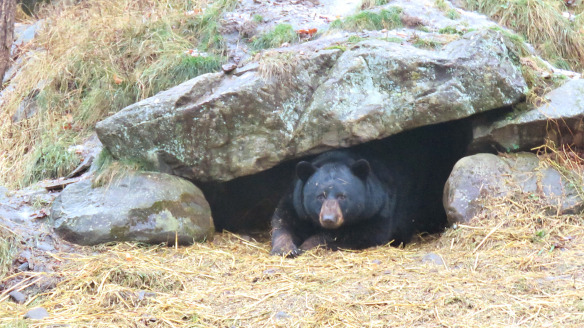 I also managed to capture a bear in his den before going into hibernation. I thought the bears would have been fast asleep since we visited so late in the season but nope. This guy wanted to say one last goodnight and I was the lucky guest to see him. Even the wolves and coyotes wanted their time in the light. Was I in a dream? 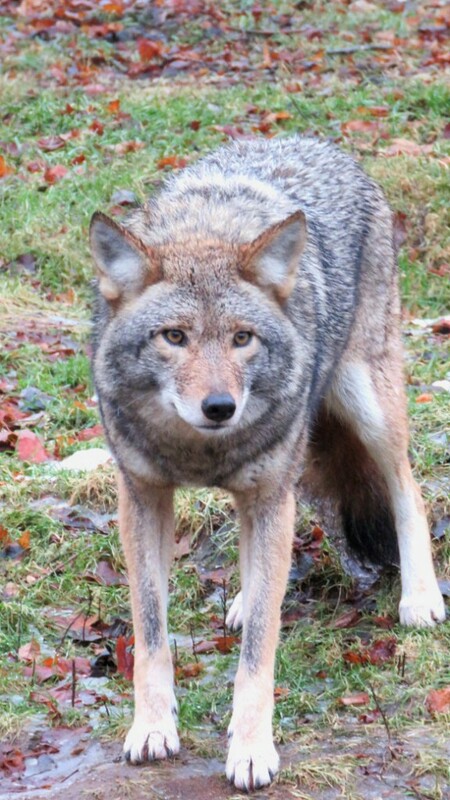 Could all of this actually happen on one visit to Parc Omega? It was bizarre and beautiful and more than shocking. Our adventure didn’t end after viewing the animals at Parc Omega because we were staying the night in a Wi-tent. We drove a short, windy road up to the accommodation area where we would sleep surrounded by bears and wolves, but don’t worry; they were on the other side of a secure fence. Again, I was glad that I was driving an all wheel drive vehicle because the dirt road became dark and slippery at night. The CX3 easily handled the conditions and brought us safely to the parking area. It was only a few minutes walk to our tent. Our conic-shaped tent was located near a small lake and strategically placed near the bears and wolves to give us the feel of being immersed in the wild, while being separated by a fence. The girls were giddy with excitement to sleep in such rustic accommodations. Although it was a tent, we had everything we needed. Inside, there were two single beds and a queen-size bed. There was a large table, seating, and a water cooler. It was as cozy as a hotel but more wild. As we settled in for the night, we heard the wolves howling. We knew they couldn’t hurt us, but it was the only time in my life I ever heard a wolf howling at night. The adults took turns keeping the fire stoked and the kids slept soundly through the night. Nothing like a fun day of adventure to give you a great sleep. The next morning, we stopped at Fromagerie Montebello to satisfy our Quebec cheese cravings. Fromagerie Montebello sells locally made fresh cheese, cheese curd, cheese strings, and fine cheeses, as well as a selection of cheeses from across Quebec. You can’t go wrong at Fromagerie Montebello but if you can only choose one item, go for the cheese curds. We bought two bags and ate them in the SUV on the drive. Normally I’m hesitant to let kids eat in the car, but with leather seats, it’s almost impossible to ruin the material. 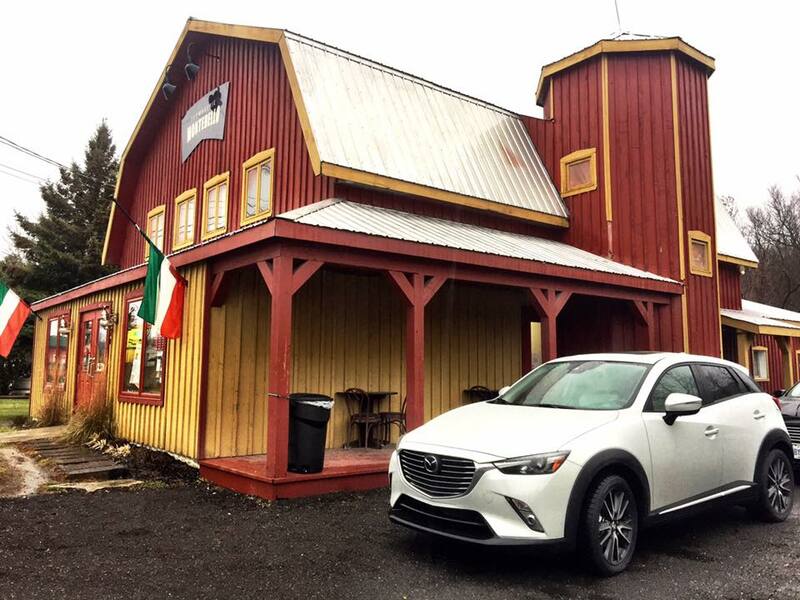 From snow and ice to muck and dirt, the Mazda CX3 delivered us safely during our Montebello road trip. We had plenty of room and lots of adventure, and it didn’t cost us an arm and a leg in gas to get there. What’s on Your Outaouais Bucket List?